It is always a delight to attend a performance of Don Carlo, certainly one of Verdi’s best operas. It is also Verdi’s most Meyerbeerian opera, premiered in an original French language version, in five acts, at the Paris Opera in 1867, in the style of Meyerbeer’s spectacular “grand operas.” Meyerbeer’s grand operas had historic themes such as the plight of the Protestants in France in Les Huguenots or the blasphemous John of Leiden in the Netherlands during the early days of the Reformation in Le Prophète. They also involved dazzling grand spectacle and a quintet or sextet of super-singers covering all voice registers: usually a tenor and a soprano for the amorous couple, a mezzo and a baritone rival, confidant or parent, a couple of basses as parents or evil conspirators. There lies the difficulty in reviving Meyerbeer operas or operas written in his style: a ruinous budget to mount an elaborate production and the difficulty and cost of finding five or six lead singers. 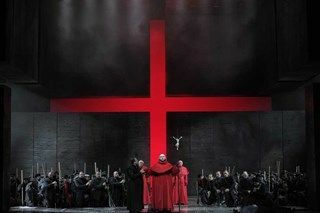 Deutsche Oper’s production of Don Carlo in its Italian four act version was a great success in the casting department, but a sad attempt as a stage production. The simple gloomy sets evoked nothing regal, during an epoch when Spain ruled half the universe. Growing up in such a setting, Don Carlo had every reason to be a tormented depressive crown prince. He had to contend with a difficult relationship with his father and his unfulfilled love for his stepmother, previously promised to him as part of a peace treaty between the Spanish Habsburgs and the French Valois houses to end the Italian Wars of the mid-sixteenth century. The Monastery of Saint Just, as place of retreat, could possibly be a sparse austere place, but the fabulous Escurial Palace cannot look like a fortress in the Gobi Desert. The garden scene, where the tempestuous trio “Ed io, che tremavo al suo aspetto” between Princess Eboli, Don Carlo and Rodrigo takes place, must be lush, floral and tantalizing to the senses; it wasn’t. Most dismal was the Auto da fe scene, where the Inquisition burns the Flemish rebels at the stake. The orchestra, and especially the chorus, did a great job of that scene, but it was depressing to see such a modest affair on stage. The Flemish noblemen coming to Madrid to present their case looked like paupers punished for vagrancy rather than heresy. Again, the spectators on stage during that scene were also paupers inspired by communist iconography. This is not what “grand opera” looks like. But happily, the leading cast was near ideal. Yosef Kang’s portrayal of the tormented Don Carlo was convincing. He acted and sang with passion the demanding role. His first act aria, “Io la vidi,” was resonant, with the requisite timbre appropriate for the role. He had a strong presence, despite awkward stage direction such as his excessive familiarity with Elisabetta during their duet, “Io vengo a domandar,” where the duet ends in a coital position. This is totally contrary to the chivalrous mores of the period and especially at the Spanish Royal court. More importantly, it goes against the psychology of the awkward prince. The object of his desire, Elisabetta de Valois, sung by Anja Harteros, was magnificent. In the second act, she adjusted her huge voice to the more lyrical and highly moving, “Non pianger, mia compagna.” Her spinto voice was ideally suited for the role. Her vocal delivery, somewhat mannered and sounding unnatural, with excessively drawn vowels, grate initially but eventually helped her portrayal as regal and aloof, yet passionate. The role of Elisabetta can often be overshadowed if the soprano does not have the necessary charisma, but there are very few spintos capable of this much stage presence and vocal mastery. Her final act aria, “Tu che le vanita,” was the vocal highpoint of the evening. Etienne Dupuis’s Rodrigo was magnificent: bursting stage presence, poise in movement, a seductive baritone voice and an amazing sense of phrasing. The stage director’s idea of him wearing spectacles was effective in affirming his idealistic and self-sacrificing personality. His Act IV, “Per me giunto e il di supremo” followed by “Io morrò, ma lieto in core,” a farewell to his cherished friend Don Carlo and to life was a masterclass in conveying emotion through proper phrasing. This was the evening’s most moving moment. Elena Zhidova has a beautiful mezzo. Her Act I “Nel giardin del bello” was charming and her Act III “O don fatale” was well sung. She has facility in her upper register, as is required for this mezzo role. She seemed less well-rehearsed for the Act I Garden trio, “Ed io, che tremavo al suo aspetto,” weakening the drama of that pivotal scene. Ildebrando D’Arcangelo was a magnificent King Philip II with his warm bass, strong stage presence and ability to be subtle. His Act 3 aria “Ella giammai m’amo” was extremely moving. His phrasing of “No, amor per me non ha,” was shattering. Alas, Matthew Rose’s Grand Inquisitor was not as imposing and terrifying as hoped. A deeper bass than King Philip is needed to have the proper effect in their blood-curdling duet. Moreover, the stage director could have summoned more imagination to make the Inquisitor’s entry in the King’s chambers more awe-inspiring. The minor role of a celestial voice, sung by Siobhan Stagg, is a voice from Heaven lamenting the victims of the Inquisition, burning at the stake. It is usually sung off stage by a brilliant high coloratura soprano with very little vibrato to convey purity. The stage director chose to have it sung by one of the paupers in the crowd. The voice, though not unpleasant, was miscast, as it was not the expected angelic voice with no vibrato. Furthermore, she carried a baby that the Inquisitors relished snatching from her as she was led to the pyre. Such excessiveness has the contrary dramatic effect. When will stage directors learn that less is more? The orchestra was brilliantly led by Ido Arad. The tempi were sometimes too fast, but the conductor was supportive of his singers, never covering them with too loud an orchestra or hurrying them. As is often the case in Germany, where the public is used to Wagner’s interminable operas, Italian operas are compacted to have just one intermission, rendering this lengthy four-act opera into a short three and a half hour evening. This is a good use of time, but it is also effective dramatically, as the action did not drag. Despite the flawed staging, this was a memorable evening.